This guide will help you transition from MacPractice 6 to MacPractice 7.3. The Careslip element has been upgraded to Diagnosis and Billing. Because of this update, your Forms section must be updated to bill correctly. To update, select a template with the Careslip element, and scroll down to the Diagnosis/Coding section. This section will most likely appear blank, as it appears in the below screenshot. Simply double click inside the section to be taken to the Section Editor. You can unlock the section by clicking the 'unlock' button in the upper right. In the Form Sections editor, you will want to adjust the Height of the element to 680 at minimum, as the element is quite large and will need the extra space to appear properly. Once this is adjusted, you can move the Diagnosis/Coding elements to take the full size of the section. If you have extra elements in this section, please contact MacPractice Support so they can assist to ensure there will be no data loss with any changes made. Using the new Diagnosis and Billing section is quite simple. You can click the green plus in the upper right corner of the Encounter Diagnoses to add a new Diagnosis to the Patient's chart. This will pull up the updated Code Finder window, which from here will have an additional tab for Care Slips. For Procedures, it functions much the same. Click the green plus to add in a relevant procedure. Using the search bar will search all of your currently active fee schedules. Once you are complete, you can click the 'Review and Bill' button to review. Once you're satisfied, the Create Order button will create an order for your billing team to post to the ledger. The Bulk Insurance Payments Manager has been adjusted so you will now use the green plus and the red minus to add and delete payments respectively. Statements Manager has been updated to clean up some preferences. You now have the option to Print Patient Payments, Print Transactions within a date range, and Print All Transactions. Setting a Statement Message is much easier now. You can also set either a One-Time Message, or an Account Message from the Statement Manager window. MacPractice 7.3 has the latest ICD-10 codes currently being used in 2017, and we have also incorporated the Favorites feature to the ICD Code Finder window. When entering new diagnosis codes, you'll see 4 tabs at the top of the window; "All", "Patient", "Favorites", or "Top 50". You can easily mark any code in this window as a favorite by scrolling to the right and double-clicking on the Star icon. To remove a Favorite, simply double click this Star again to un-favorite the code. There is also an ICD-9 Helper tool, that will help you find an equivalent ICD-10 code by searching for an ICD-9 code and then showing suggested replacements in ICD-10. You can activate this feature by checking the "Enable ICD9 Helper" checkbox in the Code Finder window. 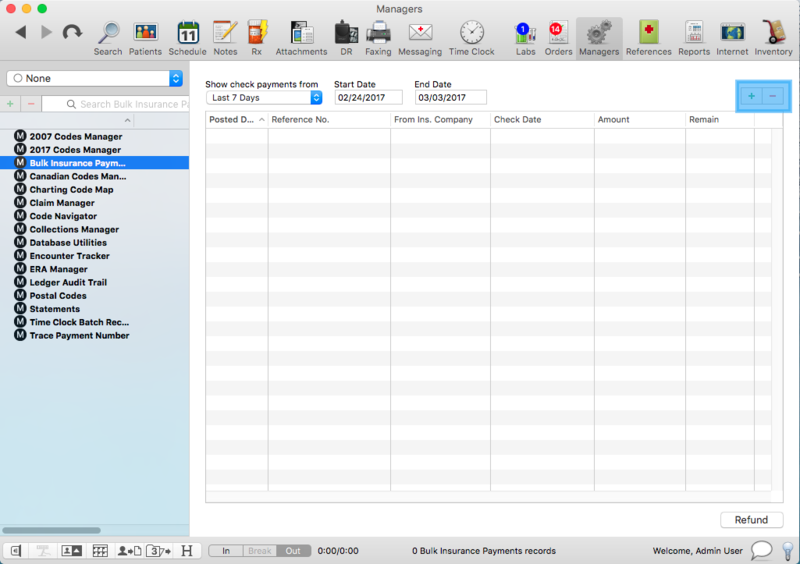 It's now possible to attach 12 diagnosis codes per charge by enabling the option to do so in Preferences > Claims.